Baby Ruth candy bars really were named after Babe Ruth! The rumor that they were not was actually started by the company who made them originally, the Curtiss Candy Company founded by Otto Schnering. They claimed it was named after Ruth Cleveland, the granddaughter of President Grover Cleveland. Ruth Cleveland supposedly visited their plant and, while there, inspired the name for the candy bar. There are a quite a few problems with the official line, but the main problem is that Ruth Cleveland died in 1904 at the age of 12 years old, some 17 years before the Baby Ruth candy bar was created and about 15 years before the Curtiss Candy Company was created. Further, Grover Cleveland hadn’t been President for 24 years and had been dead for 13 years when the candy bar was named, so there doesn’t seem to be a good reason they’d have randomly picked his granddaughter to name a candy bar after. 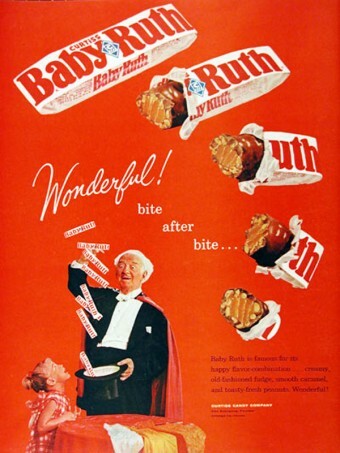 Further, the original version of the “Baby Ruth” candy bar was actually called the “Kandy Kake” and was coincidentally renamed to “Baby Ruth” directly after Babe Ruth had become a national celebrity. The Curtiss Candy Company also tried to get Babe Ruth to endorse their product after its launch, which he refused to do. Not only that, but the Curtiss Candy Company was headquartered very close to Wrigley Stadium and, in 1932, they setup a giant lit advertising sign near the spot where Babe Ruth’s supposed “called shot” landed, advertising Baby Ruth candy bars, fully visible from Wrigley Stadium. This sign remained there for four years. Over and over again they attempted to associate their candy bar with Babe Ruth. The cover story told by the company was simply a way to get around having to pay Babe Ruth royalties for the use of his nickname and last name in their marketing efforts. 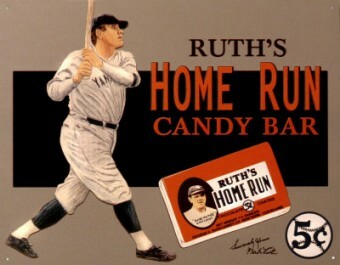 The Curtiss Candy Company even had to use this story in actual legal proceedings when the manufacturer of the Babe Ruth Home Run Bar challenged the Baby Ruth name in court, claiming the Curtiss Candy Company were using the name without Babe Ruth’s permission, something the makers of the Babe Ruth Home Run Bar had managed to get from Ruth. The Curtiss Candy Company then successfully defended their candy bar’s name using the above “granddaughter of Grover Cleveland” story, which is full of inaccuracies and strains credibility. Published with permission from www.todayifoundout.com.